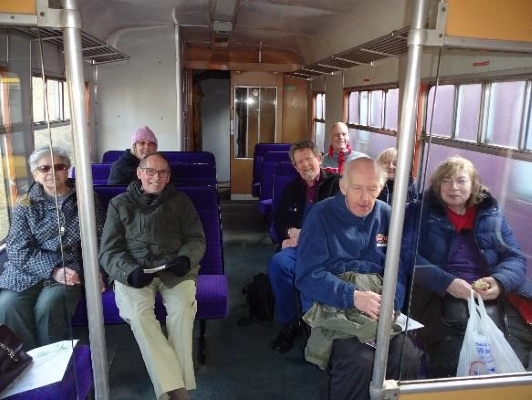 Nine Mensans enjoyed the Winter Warmer heritage rail service at Midlands Railway Centre as part of the DE postcode district tour early in February. Thank you to all my Mensa friends who sent me greetings on the occasion of my recent special birthday (one that ends in 0!) and who travelled from near and far to help me celebrate. 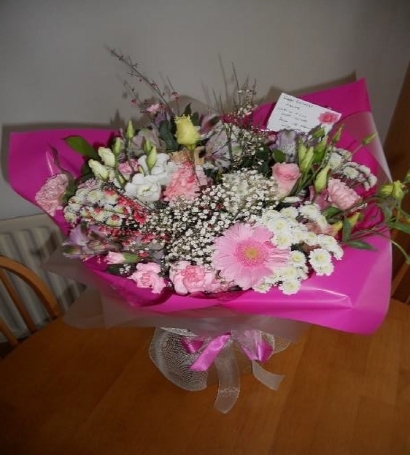 Thanks also to the officers of East Midlands Mensa who arranged delivery of beautiful flowers that were totally unexpected and much appreciated. Our series of “eat & greet” events continues and this month takes place in Belper in Derbyshire. Susan invites you to join her from 2-4pm on Saturday 13th April to find out more about Mensa over tea and cakes. Free cakes and chance to make new friends! What’s not to like!? Look out for similar events all over our region in the coming months. The Mensa office are having a push to fill all vacant roles in all regions. We are still seeking volunteers to become Local Officers for Leicester, Luton and Northampton plus a Family Officer (ideally a member with a child who is also a member) and additional Empress Editor to help Maria and Mark. If you’d like further information and a no obligation chat feel free to contact John Stevenage at the Mensa office or myself. None of the roles are too onerous and any volunteers would be most welcome to join our friendly team. I’m on [Phone Number] or [Email] if you’d like to get in touch. Welcome to the April Edition of Empress. I am back for the next three months as Editor. Big Thanks to Mark for doing his bit. He is now on his “editing break”. As the days get longer and sunnier, it’s time to clear up the winter cobwebs and start taking part in a variety of outside events. Check the advance notices for a few events due in forthcoming months. As usual, I have a photo from a previous event to encourage members to join us and a member’s profile from one of our host-event-Mensan in the Leicester area. Put a jumper on, find the garden chair and enjoy the reading! I grew up in Leicester and have now retired to Leicester. However, I spent most of my adult life in the North West of England. I studied mathematics, physics and chemistry at the University of Essex, graduating with a First Class Honours degree, before undertaking research in physical chemistry for a PhD from the University of Leicester. When I moved to the North West I initially worked for the UK Atomic Energy Authority based in Warrington, conducting research related to the safety of nuclear power plant. Later I moved to the Nuclear Safety Directorate, a branch of the Health and Safety Executive, based at Bootle on Merseyside. Here I was involved with enforcing Nuclear and Health and Safety law to protect the public and workers in the nuclear industry, from the hazards of the nuclear industry. I joined Mensa in 1995 after discovering that I could solve a puzzle in a daily newspaper within the allocated time limit. However, until I retired I was only a passive member, enjoying the status of membership and reading the sometimes off the wall articles in the monthly Mensa Magazine. I decided to become more active in the society after retirement and moving back to Leicester. In April 2012 I plucked up courage to go to a Mensa Pub meeting organised by the late Paul Coulson. I enjoyed the stimulating discussion so much that I became a regular attendee at pub gatherings; eating meetings, coffee mornings and parties in the Leicester area (I drew the line at sporting events because I was always rubbish at sports). 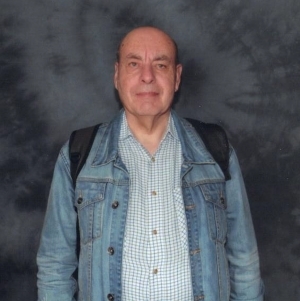 In recent times, following the untimely death of Paul Coulson, I have taken it upon myself to organise the monthly pub meetings in Leicester and the occasional eating meeting and coffee morning. So far I have not got round to joining any SIGs although there are SIGs I would like to join, if only I was not so apathetic. Outside of Mensa I have taken on the role of branch secretary for the Leicester area of the Civil Service Pensioners’ Alliance. I am also a member of Syston Evangelical Baptist Church where I attend Sunday services, midweek fellowships, social events and help out with cleaning the church building and tidying the church garden. I am a keen gardener and enjoy visiting historic houses and gardens. I am a member of both the National Trust and English Heritage. Since retiring I have been able to indulge my passion for travel. I have travelled extensively in Europe, North America, Japan, Peru, Brazil and New Zealand. My preferred modes of travel are coach tours and cruises. Most of my family live in Leicester. Since moving back to Leicester I have been able to enjoy more contact with members of my family. However I still maintain contact with my friends in the North of England. Please join me for coffee and conversation as a guest of Syston Baptist church, located on the corner of Goodes Lane and Melton Road (postcode LE7 2JS); Parking available at the rear of the church and on Goodes Lane. I shall be waiting for you inside the Church. Look out for the Magazine or Mblem. For further information or encouragement, please contact me on [Phone Number] or at [Email]. Our regular Second Saturday meeting at the Adam & Eve Tavern, 25 Lindum Road, LN2 1NT (opposite Pottergate Arch). This month's topic: "If everyone in the world could understand one concept, which concept would have the biggest positive impact?”. All welcome. Car park, decent ales, pub food, hot drinks available. Look for the Magazine on the table, usually in the alcove. Contact Jacquie on [Phone Number] or [Email] for encouragement/details. Come and enjoy a good meal and good company at Pizza Hut, Nettleham Road, LN2 1RR (opposite Waitrose). Old friends and new faces (including guests!) welcome, but please book with Jacquie by Monday, 22nd, so she can reserve a table. Phone [Phone Number] or email [Email] . Start the weekend with a drink and chat at the Vat & Fiddle pub on Queensbridge Road (NG2 1NB). Reasonably priced food also available until 8pm. Look for yellow Mblem on table, likely in the main bar this month. Need encouragement to come along? Contact Maxine on [Phone Number] or [Email]. New faces always welcome! Join our friendly group for a meal or just a drink from 7.30pm until late at The Cadland, High Road, Chilwell. We will be on a large reserved table to far side of bar with a yellow Mblem on display. Further info from Maxine on [Phone Number] or [Email] or just turn up on the night. Find Newark members at The Prince Rupert on Stodman Street for food and/or drink and varied conversation. Contact Pete on [Phone Number] or [Email] if needing directions/encouragement to come along or just look for a yellow Mblem on the night. We're usually in the room to the right as you enter the pub. A return to the Tenpin bowling alley on Clifton Boulevard in Lenton (NG7 2UW). Tuesday it's 50% off bowling and selected drinks. Two games cost £7.15 per adult or £5.90 per junior. Please express interest by 17th with Maxine on [Phone Number] or [Email] so that lanes can be booked. Free parking at the alley and food available either in their cafe or served to the bowling lanes. Traditional English fish and chips this month at George's, Wilsthorpe Road, Long Eaton, NG10 3RJ. See reasonably priced menu at www.georgestradition.co.uk and reserve your place with Maxine on [Phone Number] or [Email] by 25th. All welcome! Meet at the Bulls Head, Kelmarsh Road, Arthingworth, LE16 8JZ for a 3-mile stroll through the north Northants countryside, followed by lunch at the pub. The route includes a stretch of old railway line, including a tunnel - so bring a torch! Contact: [Email]. 07484-271589. As ever, we are at the Three Magnets, Leys Avenue, Letchworth! Thursday nights are curry nights but other food (standard Wetherspoons' fare) is available as well. Leys Avenue is the main shopping street in Letchworth and is a few minutes' walk from the station (Kings Cross to Cambridge line). Call me on [Phone Number] for more details and encouragement. As ever, we are at the Cowper Arms, Digswell. The pub is next to Welwyn North station and is served by stopping trains from Kings Cross to Cambridge. Good food, beer and conversation guaranteed! Please call me on [Phone Number] for more details and encouragement. Please check local MK & East Midlands social media for Sunday breakfast dates each month. We will be at Carluccio's in the Centre:MK on one Sunday in the month at 10:00am until the autumn. Contact Jo at [Email], or [Phone Number] / [Phone Number] for directions/encouragement. Join us at Dobbie's Garden Centre in Fenny Stratford for tea, coffee and cakes in the restaurant. We will probably be in the conservatory area at the back. Contact Jo at [Email], or [Phone Number] / [Phone Number] for directions/encouragement. Our monthly quiz outing to The Barge at Woolstone. Meet from 8.15 for a 8.30pm start - cost is £1 per person. Please contact me beforehand to check it's still on, as the pub occasionally cancels. Contact Jo at [Email], or [Phone Number] / [Phone Number] for directions/encouragement. Just a reminder about our M-MK & Bedford Facebook group – if you would like to join please search for the group and send me a request. I also keep an email distribution list for meeting reminders and any last-minute changes, so if you would like to be added to this please let me know. We hope to see as many of you as possible at one or other of our events this month. Do remember that you’re welcome to bring a guest with you, so if you’ve never been to a Mensa event and are a little nervous about coming along on your own, just bring a friend. In starting to write this I have just given myself a shock – the first issue of our newsletter “YeeHaw” is dated July 2013!!! I honestly didn’t think Country Music SIG had been going that long. The idea came to me whilst trawling through a list of SIGs looking for something to join myself; there were several connected to other styles of music but not one to the genre I love. Surely I couldn’t be the only person with a high IQ that appreciates country music? Thankfully I’m not. We have a small but loyal membership which grows by about 15% a year; members are located right across the UK which makes organising any sort of get-together pretty much impossible, which is a shame – and believe me I have tried. I write and review for Country Music People magazine and host a two hour radio show every Wednesday on www.uckfieldfm.co.uk which quite a few SIG members find to their taste. I also, since I retired, have started a management company I named Oot’n’Pik (once you know it makes sense) and become a country music blogger. My personal taste is for the less poppy styles of country – western swing, outlaw, honkytonk as well as many older, classic artists, but Country Music SIG is a broad church and welcomes anyone who enjoys the music new or old, British, American, Australian or from anywhere else. I would love to welcome new members especially if they would like to contribute to YeeHaw – reviews of concerts, albums, shared memories of trips to Nashville, opinion pieces about the music etc. Remember – you don’t have to be a Redneck. The answers to the 1969 quiz in the February issue were Caernarfon Castle, Woodstock, Wembley Stadium, Jennifer Aniston, Sea Of Tranquillity, Rocky Marciano, Madrid, silly string, Pan’s People, Georges Pompidou, Kensington, James Earl Ray, Joan Collins, Yasser Arafat, Richard Nixon, John Lennon, 3, albatross, Johnny Ball and Coronation Street. Obviously an easy one this month as lots of entries, but the winner of the £10 book token was Pamela Covey of Woburn. This month’s quiz is about musical brothers with thanks to Nigel Bryant for compiling it. Send your entries to arrive by 20th April by post to ‘20 Questions (No. 210)’, [Address], or by email to [Email]. Remember to include your name and address! 1. Which band links Butch Trucks with his nephew Derek Trucks? 2. Which group including two brothers pioneered CDs with Brothers In Arms? 3. Which two brothers played in this band and then played the Krays? 4. Which twin brothers would walk 500 miles? 5. Which group had a hit with The Sun Ain’t Gonna Shine Anymore in 1966? 6. Which duo had great success with songs like Bye Bye Love written by Felice and Boudleaux Bryant? 7. What would be an appropriate album to get Top Gear started? 8. Singing duo Bill Medley and Bobby Hatfield were better known as what? 9. Which pretend group of brothers kept going to get to The End Of The Line on an album in 1988? 10. Which group including two brothers could play All Day And All Of The Night? 11. Which rock band encouraged us to Listen To The Music in 1972? 12. Which group from Manchester told us He Ain’t Heavy in 1969? 13. Did Finbar, Eddie, George and Paul form this group when they were Sweet Sixteen? 14. In 1968 Paul McCartney’s brother may have been in the pink with this group? 15. She was in a bestselling folk trio with her brother Tom and went on to become a successful solo artist. Sadly she died in January 1999. Who was she? 16.	Who is the Breathless brother of Andrea, Caroline and Sharon? 17.	Who with his Bruvvers had a hit in 1962 with A Picture of You? 18. Which brothers published I Got Rhythm in 1930? 19. Which singing trio started with three brothers: O'Kelly, Rudolph and Ronald? 20. Which band, named after a group of Jewish warriors, contains brothers Felix and Hugo? Empress is published by: British Mensa Ltd, St John's House, St John's Square, Wolverhampton, WV2 4AH. Also: Contributors should note that, unless directed otherwise, contributions may be reproduced within other Mensa publications.